We’d love your help. Let us know what’s wrong with this preview of Wundersmith by Jessica Townsend. To ask other readers questions about Wundersmith, please sign up. How many books are suppose to be in this series or is this the last one? 4.5 Stars! Review to come! I adored this sequel. I just love this series so much!!! i’m honestly overwhelmed by how good this series is! Wow, this was brilliant fun and in my opinion even better than the first in the series. I think this one gave me all those nostalgic feelings of when I first read Harry Potter, and I couldn't help but to fall in love with the world once again and get emotionally invested in the characters. There was so much to like in this book, and Morrigan's story felt a bit darker and the stakes were higher too. I think if you like the first you will love the second! This book continues where the first one lea Wow, this was brilliant fun and in my opinion even better than the first in the series. I think this one gave me all those nostalgic feelings of when I first read Harry Potter, and I couldn't help but to fall in love with the world once again and get emotionally invested in the characters. There was so much to like in this book, and Morrigan's story felt a bit darker and the stakes were higher too. I think if you like the first you will love the second! This book continues where the first one leaves off. After some troublesome trials in book 1 we know that many of the students were dropped without a chance of making it to the Wonderous Society, but now it is time for the ones who have made it to go to WunSoc and learn about just what they can do. What I loved about this was seeing the streets that changed as you went down them and the markets which were filled with magic and mayhem. There are seasonal celebrations, festivals, dramatic events and wondrous surprises that Morrigan can barely believe. Nevermoor has so many secrets to offer if you can just start to understand it and believe in it, and this is the real beginning of Morrigan's time to explore. When first one, then another went missing, Jupiter was away, searching constantly. His nephew Jack was occasionally by Morrigan’s side – when his schooling allowed – as was her best friend Hawthorne. But with the blackmailing threats focused on Morrigan’s group, she feared she would have no one left by her side. Everyone blamed her for the misfortunes that were happening – what could she do? And what had Ezra Squall to do with it all? The fear rippling through Nevermoor was infiltrating everyone. Wow! What.A.Ride!! Wundersmith is the second in the Nevermoor series by Aussie author Jessica Townsend, and it is just as fantastical and exciting as the first. Fast paced with loads of action, plenty of magic and heart stopping tension, Wundersmith is one I highly recommend. But I also suggest Nevermoor be read first so the full benefit of the series is felt. What can I say except I LOVE THIS SERIES. Once again, Townsend pulls you into a world of wunder and whimsy, and doesn't let go. We follow Morrigan as she begins classes as the Wundrous Society, and follow her on a journey about belonging and finding yourself. Like many of the great classics of children's literature, Townsend plays with the fallibility of adults. What do you do when the people who are supposed to look out for you, to know what to do when faced with challenges, aren't there to help? What can I say except I LOVE THIS SERIES. Like many of the great classics of children's literature, Townsend plays with the fallibility of adults. What do you do when the people who are supposed to look out for you, to know what to do when faced with challenges, aren't there to help? What do you do when well-meaning adults make choices that ultimately harm you or your friends? What do you do when those with power actively wield that power in harmful ways? Townsend explores these questions with care and nuance. I love that in a book about inclusivity and belonging, Townsend has clearly taken the time to craft a world that is itself inclusive. We see a diverse range of characters, and that diversity never feels shoehorned in. We also don't get any of that, "Well, I never said Hermione wasn't Black!" retcon nonsense--characters of color are described as such, made plain in the text. All children deserve to feel seen in the stories they consume, and it's lovely to see a book that puts in the effort to include representation. As a sequel, this is fantastic. The world is expanded, the stakes are raised, and it has a distinctly darker tone than the first book. The well-meaning adults feel more insidious, the villain is more villainous. I can't wait for this serious to continue. Number two in the series and a great follow up to Nevermoor: The Trials of Morrigan Crow. The author advanced all the characters and the main story line but still left plenty hanging to keep our interest open for the next book. Jessica Townsend writes well. These are really middle grade children's books but they still stand up for an adult reader. There is plenty of action as Morrigan begins to come into her powers. She is a little bit prone to throwing herself into situations she has been warned Number two in the series and a great follow up to Nevermoor: The Trials of Morrigan Crow. The author advanced all the characters and the main story line but still left plenty hanging to keep our interest open for the next book. Jessica Townsend writes well. These are really middle grade children's books but they still stand up for an adult reader. There is plenty of action as Morrigan begins to come into her powers. She is a little bit prone to throwing herself into situations she has been warned about, regardless of her own or anyone else's danger but I guess if she was more sensible the story would not be so much fun. Five glorious stars. I’m obsessed. Oh my gosh, this cover is too perfect. I AM SO HYPED! I MAY have this preordered and there MAY be a countdown on my phone to the release date. *SQUEAL* THERE'S A TITLE NOW!!!!!!!! After having barely passed her trials, Mog is left confused and bewildered. Saying anything more about the finale of the first book or elaborating further on the title of this book, will amount to revealing spoilers for the first book. So, I'll keep mum. This book gives more reasons to the reader to draw parallels with Harry Potter. The stand-offs with the adversary, questioning one's own goodness, and an outlandishly faithful, loyal and protective parental figure will stir all those feelings inside you. But, for me, I consider HP as the trope that the Nevermoor exploits and masters beautifully! And the fact, that I can forget my adult problems and be a child again while in this whimsically crafted universe is a reason enough for me to read each and every book in the series that are yet to come out. After the wundrously magical and funny Nevermoor - The Trials of Morrigan Crow our main protagonist returns picking up where we left off. Having successfully made it through the trials in book one Morrigan will join Hawthorne and seven other scholars in Unit 919 studying at the prestigious Wundrous Society. The unit will need all there knacks as they navigate their ways through a challenging 6 months. Morrigan will have to fight through the stigma of being a Wundersmith in a land that fears them. After the wundrously magical and funny Nevermoor - The Trials of Morrigan Crow our main protagonist returns picking up where we left off. Having successfully made it through the trials in book one Morrigan will join Hawthorne and seven other scholars in Unit 919 studying at the prestigious Wundrous Society. The unit will need all there knacks as they navigate their ways through a challenging 6 months. Morrigan will have to fight through the stigma of being a Wundersmith in a land that fears them. Trying to control her abilities while learning about her kinds history is made even further complicated by one of her own who is currently banished doing everything in his power to make her, against her will, realize her full potential. This book follows on from, “Nevermoor: The Trials of Morrigan Crow.” We met Morrigan in the first book, where we discovered her story. Cursed, she was destined to die on her eleventh birthday; plus all of the bad luck that occurs is blamed on her. However, before her fate overtakes her, she is whisked away by a man called Jupiter North to the secret city of Nevermoor, where she is given the chance to join the Wundrous Society. However, of course, despite having escaped her fate, life is not going This book follows on from, “Nevermoor: The Trials of Morrigan Crow.” We met Morrigan in the first book, where we discovered her story. Cursed, she was destined to die on her eleventh birthday; plus all of the bad luck that occurs is blamed on her. However, before her fate overtakes her, she is whisked away by a man called Jupiter North to the secret city of Nevermoor, where she is given the chance to join the Wundrous Society. My eleven year old daughter loves this series, but, without doubt, these books are designed to appeal to adults as well as children. At just over 400 pages, this has enough depth to offer more than the average novel aimed at older children. With Morrigan’s patron, Jupiter North, away, she is, again, very much on her own and there is a real sense of danger in these pages, which will entice the reader to want to read on. Overall, this is an excellent sequel. I've just finished this book and I'm struggling to figure out the best way to sum up just how much I loved it. I can say with confidence that the Nevermoor series has already earned it's place amongst my favourite books. I adore Morrigan Crow, she is such a wonderful character, but it's not just her, it's Jupiter, Hawthorne, Fenestra, the hotel, the brilliantly crafted world that Jessica Townsend is sharing. I'm so excited for the next one (release date unknown), but in the meantime, I wouldn't I've just finished this book and I'm struggling to figure out the best way to sum up just how much I loved it. I can say with confidence that the Nevermoor series has already earned it's place amongst my favourite books. I adore Morrigan Crow, she is such a wonderful character, but it's not just her, it's Jupiter, Hawthorne, Fenestra, the hotel, the brilliantly crafted world that Jessica Townsend is sharing. Hach... vom Inhalt her kann ich bei einem zweiten Teil natürlich nicht viel sagen. Trotzdem weiterhin meine Empfehlung für diese Reihe! Auch Band 2 hat mich auf jeder Seite wieder begeistert und ich war nach nur wenigen zeilen wieder in der Welt von Morrigan Crow, Nevermoor und jetzt auch der Wundrous Society (Wie heisst sie auf deutsch eigentlich?). Ich liebe Jessica Townsends Schreibstil: So wunderschön beschreibend und eindringlich, dass man mitten drin ist und alles gut nachvollziehen kann. Hach... vom Inhalt her kann ich bei einem zweiten Teil natürlich nicht viel sagen. Miss Morrigan Crow, calamitous young lady of the Wintersea Republic is now preparing to become an esteemed scholar of the Wundrous Society, accompanying eight fellow students including the marvellous Hawthorne. Although compelled to confidentiality considering the dastardly mayhem instigated by Wundersmith Ezra Squall, Morrigan's Wundersmith ability is discovered and unscrupulously, an unknown antagonist is conspiring towards the extraordinary children with a bizarre series of anonymous notes an Miss Morrigan Crow, calamitous young lady of the Wintersea Republic is now preparing to become an esteemed scholar of the Wundrous Society, accompanying eight fellow students including the marvellous Hawthorne. 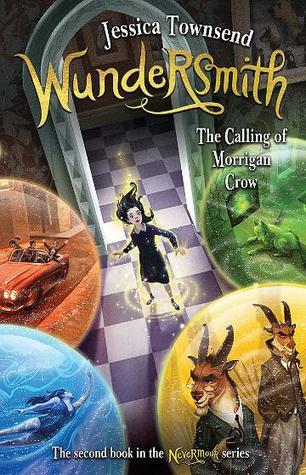 Although compelled to confidentiality considering the dastardly mayhem instigated by Wundersmith Ezra Squall, Morrigan's Wundersmith ability is discovered and unscrupulously, an unknown antagonist is conspiring towards the extraordinary children with a bizarre series of anonymous notes and peculiar stipulations. 🌻 Trigger warnings for child abuse, emetophobia, kidnapping, captivity, blackmail, mild violence, bullying, and discrimination. Morrigan zbožňuju čím dál tím víc a fantazii Jessicy Townsend taky! it was a slow start, but man the end! I liked it a lot. And I love how Morrigan is growing and HAWTHORNE IS AMAZING. I love their friendship. And I love how MOrrigan finally has people who support and love her unconditionally! Ahoy there me mateys! If ye haven’t read the first book in this series, nevermoor, then ye might want to skip this post and go read the first book. Worth the read. If ye keep reading this log then ye have been forewarned and continue at yer own peril . . . . . . I absolutely loved the first book and the crew has been saying that the second book was even better. I concur. This was amazing! It was so wonderful to be back with Morrigan and the lovely crew in Nevermoor. Morrigan has made it into the Ahoy there me mateys! If ye haven’t read the first book in this series, nevermoor, then ye might want to skip this post and go read the first book. Worth the read. If ye keep reading this log then ye have been forewarned and continue at yer own peril . . . . . . I absolutely loved the first book and the crew has been saying that the second book was even better. I concur. This was amazing! It was so wonderful to be back with Morrigan and the lovely crew in Nevermoor. Morrigan has made it into the Wundrous Society but her first year of lessons are not at all what she expected. Everyone seems out to get her – teachers, her fellow students, and the evil Wundersmith himself, Ezra Squall. I absolutely loved Morrigan’s classes and the differences between the teachers and subject matter. I adored the mystery of the missing people and where they end up. I love Morrigan’s best friend, Hawthorne Swift. I loved the reasons behind the blackmail and how it was resolved. I thought the world-building was as stellar as in the previous book and loved how Nevermoor’s history is delved into. I absolutely loved the forgotten character (what’s her name again?) and her role in the book. I continue to love Jupiter and Jack. And the wonderful talking cat. The ending was perfect. This book cast a spell on me and I want more mateys! I will definitely be reading these books again. And if ye haven’t begun this series . . . what are ye blasted fools waiting on!?! Arrr! One of the difficulties for the Tales of Morrigan Crow is that it is following on from a giant. There is more than just a little of Harry Potter in the series. All I'll say about that is whether you love this series or not will probably have a lot to do with how you feel about those similarities. For some it will be a ripoff, for others it will be an influence. Personally, I love it and I love the world that Jessica Townsend is building. It's working for me on every level. This book, this series, is so wonderful and mesmerizing! Nevermoor is incredible and I want to explore it so much more. I'm so happy that the second book has been as good to me as the first. I read Nevermoor earlier in the year and it became one of my all-time favourite books. I wanted to re-read Nevermoor before the sequel, and I was worried that I wouldn't enjoy it as much (which happens sometimes) but it was just as fantastic and made me feel right at home. This goes as no surprise to anyone who has had to listen to me talk about how much I loved the first book, but guess what? I LOVE THE SECOND ONE JUST AS MUCH. Why? Because it’s magicalfunwhimsicalwittyandstupendouslyamazing! Yeah. You read that right. It’s one word good. Morrigan is now a junior member of Wunsoc and while she thought the trials ended last year she’s come to find out more await her. There’s blackmail, disappearances, a ****boring**** class schedule, dragons, the black market, and This goes as no surprise to anyone who has had to listen to me talk about how much I loved the first book, but guess what? I LOVE THE SECOND ONE JUST AS MUCH. Morrigan is now a junior member of Wunsoc and while she thought the trials ended last year she’s come to find out more await her. There’s blackmail, disappearances, a ****boring**** class schedule, dragons, the black market, and epic parties.